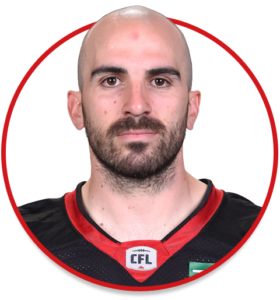 Brad Sinopoli is a Wide Receiver currently playing for the Ottawa REDBLACKS. Followed up his first 1,000-yard receiving season with another in 2016, finishing with 1,036 yards and four touchdowns on 90 receptions … Was named Top Canadian in the Grey Cup game … Had a season-high 157 yards on five receptions in Saskatchewan on July 22. Thrived in move to inside receiver in 2015, contributing 86 receptions for 1,035 yards and three touchdowns as the Redblacks became only the third CFL team to have four receivers each hit the 1,000-yard milestone … Scored first touchdown as a REDBLACK in July 4 win against B.C., finishing game with 99 yards on nine receptions … Had three 100-yard games … Received Syl Apps Athlete of the Year Award from the Ontario Sports Hall of Fame … Selected in the fourth round (29th overall) of the 2011 CFL Draft … signed with Calgary on May 20, 2011 … Made CFL debut July 1, 2011 vs. Toronto … Played first game as a receiver, July 12, 2013 vs. Montreal.